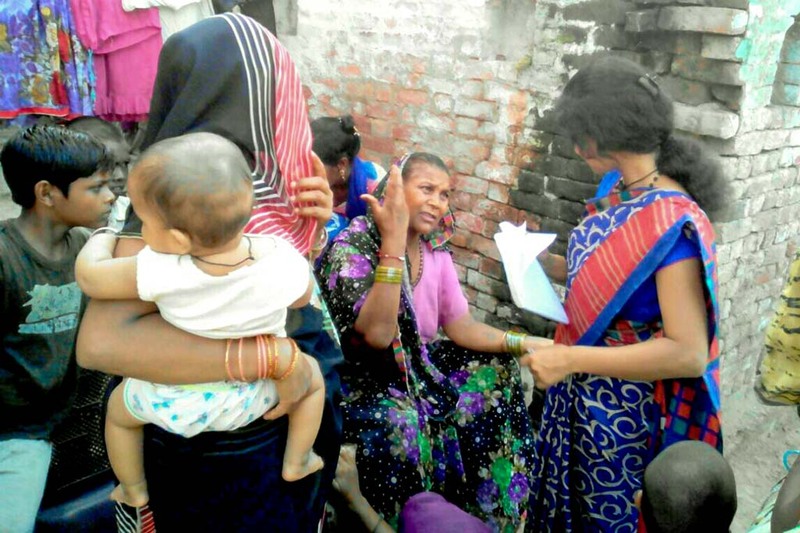 We are finding pressing health needs in our new village of Nagla Purviya in the Mathura District of Uttar Pradesh. Brahmacharini Swati, the Amrita SeRVe Health Coordinator and Rajesh Nayar, the Amrita SeRVe Zonal Coordinator, are there assessing the situation. The local tuition teacher, Pinky, joined the Amrita SeRVe team to facilitiate. Five pregnant women had testing done. Sugar levels, blood pressure, and weight of the mothers were tested. ANC’s were also performed—this is a way to measure the baby’s fundamental height, place and position. Our health team also observed that the health facilities in the nearest public health centre (PHC) are not highly accessible for pregnant women. Then a general health check was done for villagers. Many people were found to have joint pain and children had frequent diarrhoea. There are also dental issues, recurrent fevers and gynaecological problems among the women. Next we held a session on women’s health overall. Seventeen adolescent girls and 11 women attended. Upon investigating these details, Amrita SeRVe will quickly take next steps to address these health issues.